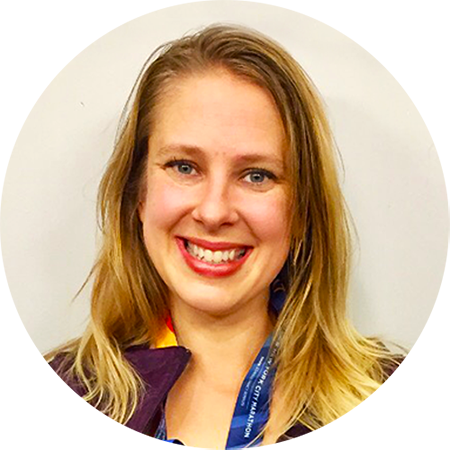 Angie Knudson brings several years of experience as a running coach and holds her running coaching certification from the Road Runners Club of America. Angie is National Director of Run & Walk Programs for Culture Of Fit. She is a seven-time marathoner, running tour guide, run club leader and trainer for 5k, 10k, half marathons and marathons. She brings not only her running expertise to Culture Of Fit, but also her experience of 10 years as an American Academy of Personal Training (AAPT) certified personal trainer, over 5 years of being a high intensity interval training (HIIT) and bootcamp instructor, and her 200-hour RYT Registered Yoga Teacher expertise. On deck for racing this year is her 6th Brooklyn Half Marathon, 1st Yellowstone Half Marathon, and her 6th New York City Marathon. In addition to leading running and walking programs for Culture Of Fit, Angie’s role as Culture Of Fit’s National Director of Run & Walk Programs, includes assisting in the hiring, training and onboarding of new running and walking instructors, ensuring high quality, consistent instruction and programming across the nation and developing and leading programs and instructor trainings. Angie is sharing her expertise as an exceptional mentor to the Culture Of Fit instructor team. Angie is passionate about helping people achieve their fitness and wellness goals, and also recognize their inner athletes. She strives to create well-rounded running and fitness programs, incorporating her knowledge as a certified yoga teacher, Barefoot Training Specialist, and pre and postnatal training education into her programming. She teaches and trains all over New York City—a typical day for her may include teaching yoga at the Bronx Veteran’s Center in the morning to coaching runners at Culture Of Fit’s clients along the river promenades in the evenings. Angie holds a BA in English with an emphasis on Creative Writing and Literature from the University of Montana.